Experts in the area of Minimally Invasive Surgery, our clinically trained sales staff is supported by in-house clinical professionals. PMI’s synergistic product portfolio reduces healthcare cost by maximizing clinical efficiency and improving safety for patients, employees, and providers. PMI offers a range of surgical products, selected to offer cost savings WITHOUT clinical compromise. 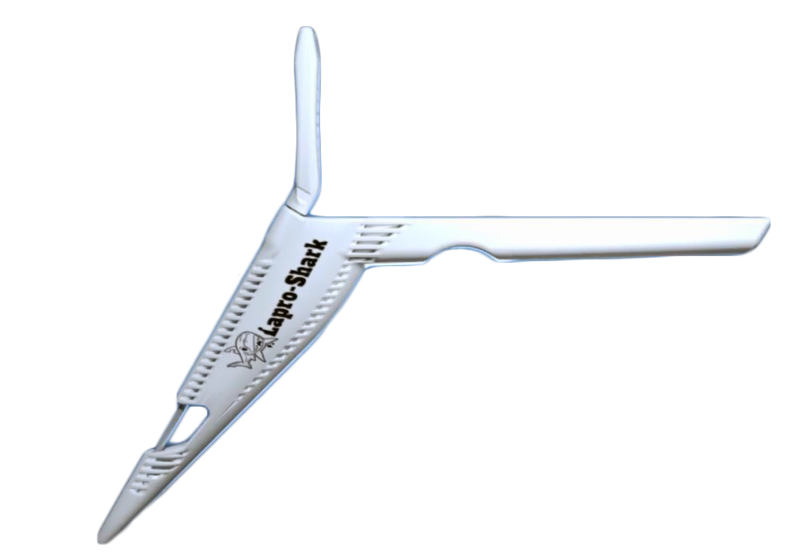 The Lapro-Shark™ is designed to provide an optimal bite of fascia for port closure suture, while minimizing the capture of subcutaneous fat. This laparoscopic closure device with its ergonomic handle, allows for easy manipulation and precise control over the depth of the fascial bite and is designed to yield reproducible fascial closure. The Lapro-Shark is intended for the closure of trocar sites of 10mm or greater. Progressive Medical Inc. is excited to partner with Cook Biotech Inc. to distribute the Biodesign® Hernia Graft. The technology behind Biodesign tissue-repair products is supported by more than 1,400 published articles. More than 500 of those describe use in humans, and 10 of those have more than five years of follow-up data. The Biodesign® Hernia Graft is intended for implantation to reinforce soft tissues where weakness exists. Indications for use include the repair of a hernia or body wall defect. The graft is supplied sterile and is intended for one-time use. Please visit Cook Biotech for the Biodesign® IFU. GENICON’s complete range of single-use bipolar and single-use mono-polar instrumentation cover all necessary functions performed during laparoscopic surgery. Available with both a non-locking handle and a switchable ratcheting handle, these electrosurgical instruments offer consistent, precise performance. The X-Surge™ solid state drive shaft is compatible with Surgical Innovation®’s handles and the X-Surge enhanced cutting, reposable shears are compatible with Microline® handles. For more information on any of the electrosurgical product offerings, please review the brochure below. MICROLINE® is a registered trademark of MICROLINE SURGICAL®, Inc.
GENICON’s ligation and clips product portfolio offers the A Li-Gator™ disposable clip applier which delivers reliable performance, comfortable grips and pre-loaded titanium clips. The A Li-Gator™ device is designed to provide surgeons a 360° rotation knob, a tip angled at 20° to facilitate visualization of anatomic features, and an ergonomic hand piece to facilitate control. The GENIClip™ reusable clip applier offers the same reliable performance, comfortable grip and different jaw options to choose from. Offered in as detachable and non-detachable this device is designed for ligation with titanium clips with anti-slippage grooves, which offer secure closure and no memory effect to prevent clip from opening after application. The GENIStrong™ bag is an easy-to-use tissue retrieval system designed to temporarily contain a specimen and enable its removal from a patient during laparoscopic surgery. This redeployable retrieval bag is made of rip stop nylon with polymer coating to prevent tears and leaks. The SIMPLYStrong™ bag-only tissue retrieval bag is comprised of a flexible plastic bag with a large, easily accessible opening, a top and bottom tab, and a closure suture. A string with a closure suture facilitates closure of the specimen bag after the specimen had been collected. The EZEERetrieval™ Poly Introducer specimen bag is comprised of a flexible plastic bag with a large, easily accessible opening, an actuation rod with thumb ring handle, finger rings, string and closure suture, and an introducer shaft. GENICON’s Single-use suction irrigation system with “Comfort and Control” lead the way with an ergonomic hand-piece that fits into either the left or right hand. The friction reducing, double sealing valve systems provide precision operation of the suction and irrigation functions while preventing leakage. High capacity tubing opens the gateway for easy flow of fluids & masses through the entire system, virtually eliminating clogging. The wide array of suction probe attachments, combined with the Speed-Connect system, collectively facilitates rapid exchange of any desired suction-irrigation function simplifying the lavage process. The GENICON® veress needle provides a high quality and cost effective means of insufflating the abdominal cavity and is designed with an intuitive push on/off button for C02 flow. GENICON’s Single-Use Trocar Systems provide versatile, operationally flexible, and unique modes of entry into the abdominal cavity for any laparoscopic procedure. 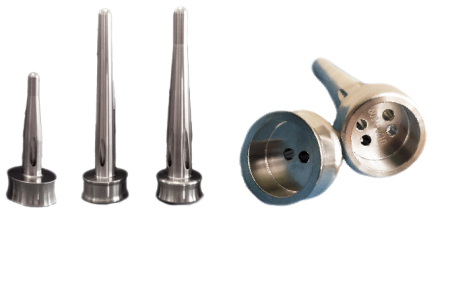 The distinctively engineered tips greatly reduce wound defect sizes as well as insertion force into the abdominal cavity. Several GENICON® trocars offer a patented handle design, an industry-first, this handle is made from a single polycarbonate mold providing sturdiness and reliability with trocar placement. For more information on any of the trocar & port system product offerings, please review the brochure below. PMI’s extensive Non-Stick PTFE Coated Electrode product offering includes disposable Electrosurgery Tips, Laparoscopic Blades, L-Hook, J-Hook, LLETZ Tips, Tungsten Micro Needles, push button pencils with holster, and single use REM ground pad. PMI’s non-stick monopolar electrodes feature polytetrafluoroethylene (PTFE) coating which helps to reduces eschar build-up during surgical procedures. The Extractor-EZ® is a retractable scalpel designed for insertion into a trocar site. With the blade retracted, the surgeon is able to maintain pneumoperitoneum while guiding the blunt shaft of the device into position under direct vision with the camera. Once the shaft is positioned, the blade can be deployed to make precise, controlled incisions in the fascia to make specimen extraction easier. PMI Huber Straight Needles are intended for administration or removal of fluids from implantable ports (IP). The design of the deflected, non-coring needle allows for greater septum life, while our color-coded, enhanced grip hub enhances safety. Our port access needles with beveled cut tips are offered in a variety of lengths and gauges, and are power rated at 300psi for contrast-enhanced CT imaging procedures. PMI Insufflation Tubing offers high flow, kink resistant, DEHP free tubing with a micron filter ensuring a 99.999% efficiency rating. Our disposable 10ft insufflation tubing sets are ½ inch in diameter, with a 52lpm flow rate and are available in 4 connection types. The PMI Kittner is used for blunt dissection of tissue during laparoscopic procedures. Our kittner comes with a radiopaque tip and is offered in single sterile unit packaging. Our disposable laparoscopic cholangiogram catheters are designed for ease of use and enhanced safety. We offer cholangiogram catheters in a variety of sizes for port insertion, percutaneous insertion, and traditional open procedures. PMI’s cholangiogram grasper offers versatility by functioning as a grasper, cholangiography instrument and an aspirator. The PMI Scope Warmer pre-warms multiple endoscopes in less than a minute and stays warm for over 2 hours. Our sterile, disposable scope warmer is longer in design to accommodate daVinci Robot Scopes. The PMI Suture Grasper is a versatile suture passer providing optimal maneuverability and precise control for fascial closure in laparoscopy. This multi-use instrument can also be used to temporarily tack hernia mesh, and assist in percutaneous tissue retraction. 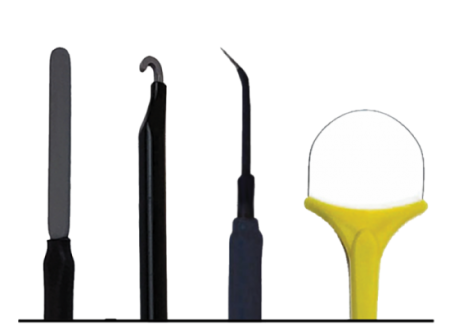 The ergonomically engineered handle and retractable grasping jaws permit multiple closures, on virtually any size trocar with any size suture. The PMI Suture Guides are designed for consistent and secure suture passing. These stainless steel angled cones have holes precisely positioned to enable full thickness closure of the fascia. FasTouch™, with its lightweight deployable sutures, provides comprehensive hernia mesh fixation for hernia repair. The fixation strength of the sutures stems from the closed locked-loop suture concept. The minimal amount of material in the sutures may reduce foreign body response and chronic pain. Designed like hernia sutures, delivered like hernia tacks, the revolutionary light-weight design significantly minimizes implanted foreign body material. Reloadable suture cartridge-based system may reduce cost and supports a variety of clinical needs. The West Sterile Drug Transfer Device is a cost-effective solution for the safe and rapid transfer and reconstitution of medications between vials and syringes. 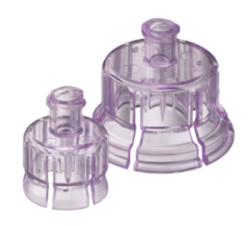 This versatile device is an efficient needle-free alternative for dispensing medications to the sterile field as recommended by AORN* and can be utilized in all patient care areas for safe medication preparation and administration.